Hazard: Burners on the electric ranges can fail to turn off after being switched off and the temperature setting can increase unexpectedly during use, posing burn and fire hazards to consumers. Incidents/Injuries: LG has received 80 reports of incidents involving burners failing to turn off or the temperature setting increasing unexpectedly during use. No fires or injuries have been reported. Description: The recalled ranges involve models LRE30451, LRE30453, LRE30755, LRE30757, and LRE30955ST. They were sold in black, white and stainless steel and with a smooth black ceramic glass top cooking surface. The recalled ranges have serial numbers starting with 512, 601, 602, 603, 604, 605, 606, 607, 608, 609, 610, 611, 612, 701, 702, 703, 704, 705, 706, 707, 708, 709, 710, 711, 712, 801, 802, 803, 804, 805, 806, 807, 808, 809, 810, 901, 902, 903, 904, 905, and 906. The model and serial numbers can be found on a label that can be seen by opening the storage drawer at the base of the unit. The electric ranges are about 47 1/2 inches tall to the top of the backguard, 29 inches wide and 28 inches deep. Sold at: Best Buy, Home Depot, Sears, and regional appliance retailers nationwide from January 2006 to June 2010 for between $800 and $1999. Remedy: Consumers should immediately contact LG to schedule a free in-home repair. 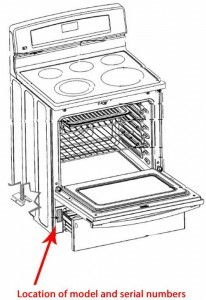 Consumers whose burner heat setting cannot be regulated by using the controls or who experience problems with a cooktop burner remaining on, should immediately stop using the recalled electric range until it is repaired. Consumer Contact: LG; toll-free at (855) 400-4638, from 8 a.m. to 7 p.m. CT Monday through Friday, and from 8 a.m. to 2 p.m. Saturday, or www.LG.com/us and click on Public Notices in the Customer Services section for more information.